Tracking of all the instruments is done. Over the course of a long night and an entire afternoon a few days later, we completed eight songs. Last night, after we were finished, we kept sending one another text messages saying things like "did that really happen?" and "I can't believe that we don't have to worry about it." 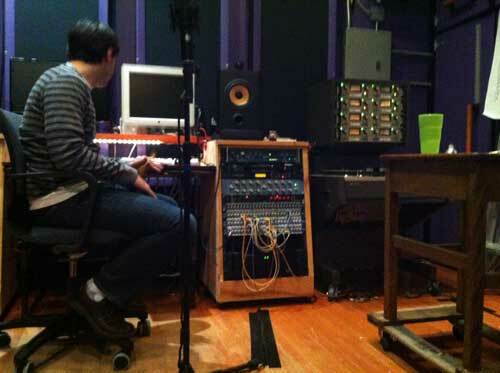 Different bands take different approaches for how to record music. 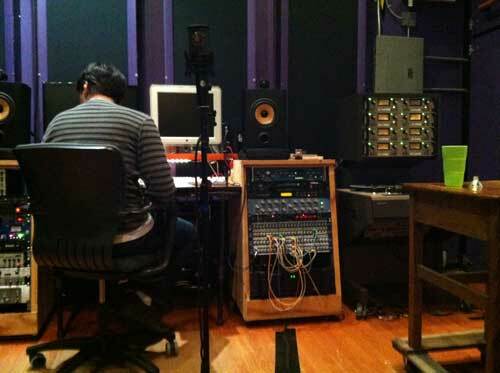 For some, the whole process of being in a recording studio is an opportunity to create something that isn't already there, so they'll use new sounds and composition ideas to pull the music together. For others, it's a chance to present a precise version of their songs. This usually means assembling the entire recording out of discrete events, having each instrument recorded by itself and inserted into the final whole. In both of these cases, the tools of digital recording are a helpful part of the recording process. Using a computer to record means you'll have a much easier time editing and manipulating the originally recorded sound. This isn't important for us. The precision and attention is all devoted to the technical process - selecting which microphones to use, where to put them, what types of pre-amplifiers for the microphones get used and other stuff like that. But once the whole thing is in place, it's really just a matter of hitting record and playing the songs together live. There are some small fixes that get made; using a tape machine with 8 tracks allows us to go back and fix a missed note during a riff or a mistake on timing. But we like to present some of the minor rough edges to give a sense of the actual context that the music you're hearing was recorded in - pedals clicking on and off, fingers sliding over strings, a bit of amp bzzzz. I wouldn't go so far as to say that this is a better way to record a band than the other ways I note above. But it is nice to find a method of working that suits what you're trying to do well. And we hit our stride with that yesterday. While the whole recording process can be a heavy and slow chore, there were a few hours yesterday afternoon when we were just blasting through it. We'd get through a take of a song, review it and make notes of what needed to be fixed. Then we'd switch back and forth - one of us operating the tape machine to punch in and out while the other re-ded his small part. And then it was time to move on. Vocals up next. We'll see how many I (Justin) can do in one night on Wednesday.